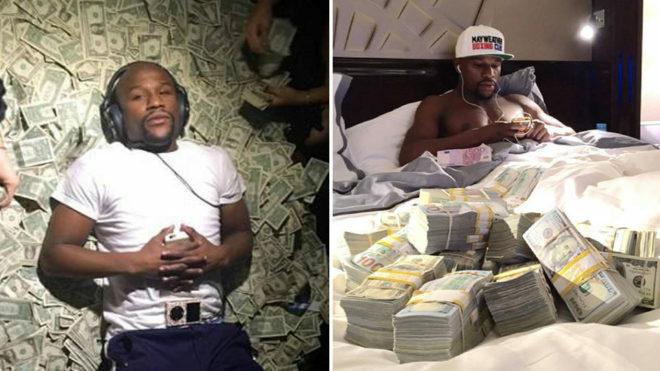 Nicknamed ‘Money’, Floyd Mayweather it seemed at some point had so much cash he didn’t know what to do with it, but now it appears to be drying up, and an extravagant lifestyle could be the main culprit. Over 19 years in professional boxing, and with a record of 49-0 it is little surprise that he is a major name both inside and outside of the ring. “I have achieved everything, I’m still undefeated and there is nothing left for me to prove,” he said. With 23 belts to his name, many consider Mayweather the best pound-by-pound boxer of his generation. According to Forbes, he is the richest athlete in the world, and now he may be going bankrupt. “I make seven digits without moving a finger,” Mayweather bragged. Parties, private jets, a luxury car collection, jewelry etc… this is the daily life of the iconic boxer. Despite raking in 75 million dollars a year, his spending is out of control, according to Tony Robins of Time and Fortune magazines. Ex-associate and rapper 50 Cent warned of what could happen. “If you stop fighting, then the money flow stops,” he insisted. In this light, perhaps a fight with Conor McGregor could be on the cards after all.